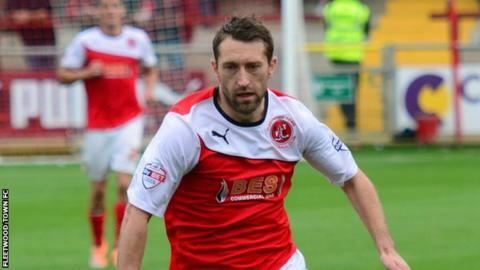 Stephen Dobbie extended Fleetwood's unbeaten start to the League One season with a late goal against Leyton Orient. O's goalkeeper Adam Legzdins saved from strikers David Ball and Jamie Proctor before Mathieu Baudry headed against the post for the visitors. Darius Henderson finally put Orient in front when he headed under keeper Chris Maxwell from Jobi McAnuff's free-kick. But substitute Dobbie earned Fleetwood a late point with a low finish on the turn past Legzdins. The home side nearly won it late on but Legzdins denied Gareth Evans after a counter-attack. The result sees Fleetwood move down a place to second with 11 points from five games whilst Leyton Orient remain 14th. "I'm delighted with a point. I thought we thoroughly deserved it and were good value for it as well. "We started well for the first 30 minutes and had a couple of chances which we should have taken. "They're a danger from set-pieces and the goal knocked us back. "We were still suffering a little bit, but we finished fantastic and thoroughly deserved our equaliser." "To be honest, they were the better team for the first 20 minutes, they created a couple of opportunities. "It took us a little bit of time to settle down but once we did settle, we seemed to get on top a little bit. "We should have stopped the goal, the boys, myself, the staff, everybody will all be very disappointed with the one we've conceded, but we should have also broke their heart really by getting a second goal. "We'd worn them down, it's just a pity because it would have been a conclusion to a great week for us." Match ends, Fleetwood Town 1, Leyton Orient 1. Second Half ends, Fleetwood Town 1, Leyton Orient 1. Attempt missed. Josh Morris (Fleetwood Town) right footed shot from outside the box misses to the right. Attempt missed. David Mooney (Leyton Orient) right footed shot from outside the box misses to the left. Corner, Fleetwood Town. Conceded by Adam Legzdins. Attempt saved. Gareth Evans (Fleetwood Town) right footed shot from the centre of the box is saved in the bottom left corner. Attempt saved. David Mooney (Leyton Orient) header from the right side of the six yard box is saved in the centre of the goal. Steven Schumacher (Fleetwood Town) wins a free kick on the right wing. Stephen Jordan (Fleetwood Town) wins a free kick in the attacking half. Jay Simpson (Leyton Orient) wins a free kick in the attacking half. Substitution, Leyton Orient. Shane Lowry replaces Elliot Omozusi because of an injury. Attempt missed. David Mooney (Leyton Orient) right footed shot from the left side of the box is high and wide to the right. Substitution, Leyton Orient. Jay Simpson replaces Darius Henderson. Goal! Fleetwood Town 1, Leyton Orient 1. Stephen Dobbie (Fleetwood Town) right footed shot from the centre of the box to the bottom left corner. Assisted by Josh Morris. Substitution, Fleetwood Town. Matty Blair replaces Antoni Sarcevic. Corner, Fleetwood Town. Conceded by Lloyd James. Attempt blocked. Stephen Crainey (Fleetwood Town) right footed shot from outside the box is blocked. Corner, Fleetwood Town. Conceded by Elliot Omozusi. Substitution, Leyton Orient. Bradley Pritchard replaces Jobi McAnuff because of an injury. Corner, Leyton Orient. Conceded by Nathan Pond. Substitution, Fleetwood Town. Stephen Dobbie replaces David Ball. Corner, Fleetwood Town. Conceded by Mathieu Baudry. Attempt saved. Josh Morris (Fleetwood Town) right footed shot from outside the box is saved in the centre of the goal.